For John Taranta, owner of GT Concrete & Decorative Work in the Detroit, Michigan, area, exposed aggregate is proving to be the cornerstone of a successful company. "We started doing something new—we call it stamped aggregate—where we'll stamp concrete, but we'll expose certain areas and we'll reveal the stone," Taranta explains. GT Concrete is also incorporating lighting into their exterior work with rave results. "We're the only people around here that actually incorporate lights right into the patio," adds Taranta. "That and the exposed aggregate, the combination stamping, that's really taking off." Like many in the business, Taranta got his start through family and spent his summers doing flat work. "It evolved from there after high school and college," he says. "Once I had the taste of the creating, working with my hands, it's just hard to go any other way." In 1996, Taranta started decorative work and hasn't skipped a beat since. "I just fell in love with it and now primarily that's all we do—higher-end residential decorative work," adds Taranta. Though the work has been primarily exterior, GT Concrete is slowly adding some interior work, mostly commercial retail. "Where I live here in the Detroit metropolitan area, indoor is starting to pop up more and more, but it's not as prevalent as out west or down south," explains Taranta. GT Concrete serves the Detroit metropolitan area, within 25 to 30 miles with close to 2 million people. "It's a big market from one extreme to another, but there are some very high-end areas," continues Taranta. "But the competition is very fierce also. 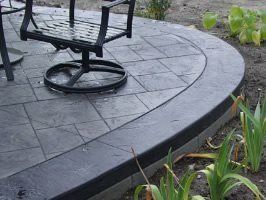 Every year it seems like more people are doing decorative and that's why every year, we try to continue to evolve and introduce new things in our product line, from integrated lights into our patios, to decorative exposed aggregate borders. We're just trying to keep one step ahead of the competition." Another way GT Concrete stays ahead of the competition is by focusing on quality. "Bad work can affect the industry as a whole," Taranta observes. "People just want to make sure they get a quality job and a unique look. They want to stand out from their neighbors or what the majority of the people are doing." GT Concrete's unique looks are generally a collaboration between Taranta and his clients. "We'll sit down, and we'll sketch," he explains. "They'll give me their ideas and before you know it, we've created something I didn't even know was possible. [Clients] like the one-on-one relationship that I can provide because we're a smaller company...So obviously I'm limited in how many projects I can do, but I can maintain the level of quality that I'm used to and I want to provide." "I [also] try to encourage creativity with shapes, lights or different types of borders...just trying to create something that's unique. And that's what they want; they want something functional...everybody wants to stay one step ahead of the neighbor it seems like," Taranta adds. When he's not in the field, Taranta's experimenting in GT Concrete's new shop/showroom that opened last year. "We must use 50 yards of concrete a wintertime making samples or creating things...it's part of the process," he adds. "We get a lot of ideas from magazines and The Concrete Network...Just seeing what the different manufacturers are offering and experimenting with the products." Taranta also focuses on education to stay ahead of the game. "I think that's a must," he says. "Anyone in the decorative business or in the construction industry as a whole...has to stay on top of the different trends and materials, and if they're not educating themselves consistently, they're just going to fall behind...continuing education is vital." GT Concrete recently put all their skills to the test for a large commercial project in the Chesterfield Township, where they resurfaced a 5,000-square-foot cinema floor, one of the bigger resurfacing interior jobs they've completed to date. 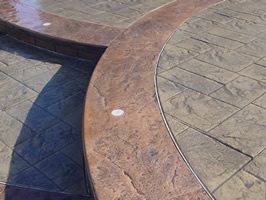 "That was one of the bigger projects I've ever done with overlay material, and the company Ardex was phenomenal as far as support," Taranta says of the company whose product he used for the job. "They actually brought a tech out and helped us set up and basically worked with us as we did the stain work and the scoring." 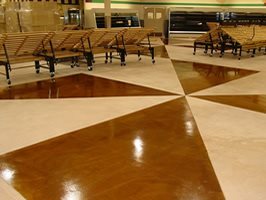 The job—prepping, overlays, scoring and staining with five colors and epoxy—was completed in four days. "We were working around the clock because there were time constraints," recalls Taranta. "But I can never do that again. I feel like it took about five years off my life." For now, Taranta is happy to focus on exposed aggregate. "I'm really, really happy with way we're doing it," he says. "We're stamping it and then revealing different sections of aggregate but keeping a monolithic floor. And I think that's really taking off because it does give you a really unique look, and I really see that exposed aggregate as a whole, adding color to give different tones, it's really making a comeback. I'm a big fan of it." 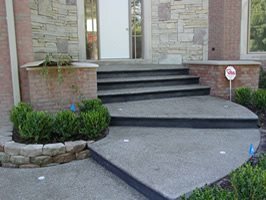 GT Concrete currently garners most of their (primarily exterior) high-end residential work through word of mouth. "We do about 80 projects a year, and that's really more than we can handle," laughs Taranta.